The expression “place where… fall” (mawqi) also mentioned in the sura, “The Cave” (Kehf), verse 53, means the place where the sinners fall, i.e., hell. The root of this word is “waqa’a” and it means the action of falling, a happening and an incidence. Stars perpetuate their existence with hydrogen bombs exploding in them. During these explosions a portion of matter is transferred into energy, emitting heat of immeasurably high temperature. Conversion of one gram of matter into energy may be obtained by burning two million kilograms of coal. For instance, in our sun-which is but a star of medium size-four billion kilograms of matter are converted into energy every second. A star uses but a small portion of its matter as fuel, and when this fuel is exhausted, it dies off. The lifetime that God designed for the living had also been apportioned for the stars. As new stars are born somewhere in the universe, the old ones bid farewell. The place where the stars fall is stressed by an oath coupled with the epithet “mighty.” We shall see incommensurately great mathematical figures in connection with the death of stars whose fuel is exhausted. Everybody versed in physics knows that one of the most interesting phenomena in the universe is the black hole that comes about in the wake of the death of massive stars whose magnitudes are greater than three times the size of our sun. Having depleted their fuel, these cosmic bodies die, collapsing inward upon themselves. The giant stars that contract possess a great gravitational force. This force is so immense that even light, with its velocity of approximately 300,000 km/sec, cannot escape it; these black holes absorb even the light that passes by. Later on, a great many planets and stars are attracted by this gravitational force. 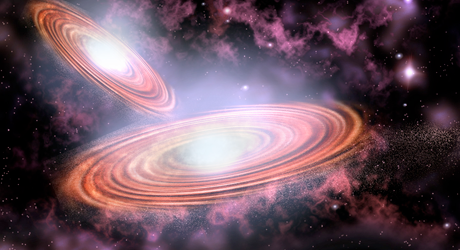 Black holes also constitute “the place where the stars fall.” The existence of black holes is deduced from the fact that they attract as whirlpools the matter of other nearby stars; swallowing all the lights and stars around.. The black holes formed by the collapse of stars by their gravitational force are in perfect conformity with verses 75-76 of the sura “The Inevitable”. At the time of the descent of the Quran, the end of a star by being transformed into a black hole was something unknown. A star turning into a black hole and the stages it goes through are very interesting phenomena. Some stars die following different processes. Some of them grow in size at first, as if inflated. Their temperature, around 15 million degrees, rises up to 100 million degrees. They are first transformed into red giants or super giants. The area covered by a super-giant is so vast that it can easily contain more than sixty million suns. The immensity of these numerical values is reminiscent of the magnitudes indicated in 76th verse of the sura. While all these spectacular events are taking place, we, on our planet, continue to sleep, run and talk, quite unaware of them. So is our life: rendered possible by forces beyond our knowledge.